I used to care, I used to care a lot, give allowances and give due consideration. Whilst much of my actions might not have shown as much as I would have wanted to show, I kept my handicaps to myself and presented a façade of normalcy in the midst of turmoil. Away, distant and almost estranged, I wandered into a wilderness of stark reality as my life flashed before me, there was too much pain to even think of the sentence that was upon me, no opportunity to close the books if the end came swiftly, I listened, prayed, hoped and persevered. Persevered in a foreign land, away from all but friend and neighbour that stuck closer than blood to nurse me back to health and wellbeing. To health and wellbeing I did get, but everything else I lost, yet I neither quibbled nor complained, I thought and strove, hungered and struggled, my confidence at its lowest, my knowledge and skill falling behind the times, I attended interview after interview with no luck but the refrain that I was no more good enough for what I was once best at. Allowances I have made without encumbrance, much respect I have offered to many after me because as individuals they have grown and in my absence I believed I had no right to order or command, I just advised. Many times, my seemingly good advice fell on deaf ears because in their eyes I was probably inconsequential except in special cases where means made me amenable. I opened my hands and opened my heart, yet in my singular existence I thought the thoughts of all, cried in my loneliness and saddened by my infirmity and my inadequacies, I was almost forlorn. In the midst of this, truculence, recalcitrance, obduracy and intransigence came to the point where it will no more be condoned. I withdrew contact and communication, in that I also withdrew support and this is a decision I have made because it was the only one left to be made. Can I be cold-blooded? Yes, I can, not by default but by situation and circumstance within which I have lost the emotion and the last hold that anyone can use to rein me in – Blackmail! I have found self and selfishness, most of all, I have reached a point of rationalisation, the actions I have taken, I will not regret. One morning when I was still living in Amsterdam, I walked up to the bus stop one morning to catch a bus to the train station one my way to work. Until, that morning, we had 5 buses going from that bus stop in different directions going to the train station that no one had to wait more than 10 minutes for a bus to come by. However, no bus came, or the only other bus that did was not going to the station. One cursory view of the bus timetables showed that all buses from that stop to the station had been cancelled. I was later to learn that the buses were cancelled because there was a new tram service going to the train station, only that the said tram service was another 6 months away from coming into service. This was some sort of forward-planning made without considering the impact and consequence on our community for the 6 intervening months where we had to find alternative convoluted arrangements to get to the train station, we had to wake up earlier and leave home earlier to make our connections because of this. This brings me to the issue of the day in UK politics, the review of Tax Credits as proposed by the Chancellor of Exchequer. That Tax Credits exist in and off themselves is a travesty and a failing of the democratic capitalist model we have in the UK. Tax Credits are neither taxes nor credits but a socialist means of supplementing the incomes of workers who are paid such atrociously low salaries in the public and private sector that they can hardly subsist on their incomes. In a way, our capitalist framework does not pay fully for the employment and utility of labour and the slack is taken up by the public purse in the quest to lift the poorly paid above the poverty line. There are probably macroeconomic policies that can be put in place to make capitalism pay up in full for the cost of labour and expertise, allowing for a middle-class kind of existence, but no government has had the guts to stand up to business and demand they do the morally and ethically right thing about wages. In most cases, these businesses that leach of us to exist for the primary profit motive will howl about changes that cost them more when they are not even meeting their basic costs. What the new Conservative government plans to do is to reduce the level of income at which people will qualify for the full in-work benefits over which the payments reduce and to limit the benefits towards children to a maximum of two. We are told that changes to the living wage, higher tax payment thresholds, more subsidised childcare access and other tax jiggery-pokery will compensate for the loss of Tax Credits. The fact is like the transport situation I described earlier, nothing could be further from the truth. Independent analysts and institutions have already determined that all taken together, up to 3 million families will be worse off, losing an average of £1,000 a year whilst saving the government up to £4 billion in their ideological quest to plug the deficit brought on by the financial system gone riot and the government using public money to save private financial atrocities for which no significant member of the financial community has been held accountable for. In all, it is the poor and the low-income earners that have taken the bigger brunt of the austerity measures put in place to compensate for the ‘crimes’ of the City and rich investors, the squeeze is still on the poor without respite. This might well be the Conservative government’s Poll Tax moment, but I guess not much can be said for the concern or consideration of a well-heeled governing class who have trust funds to last generations that the cries of anguish of the masses will only be an irritation to be blocked out in the comfort of their gilded and soundproofed castles. This is not the Great Britain many signed up for, but that is the way things are. My transport situation was resolved in 6 months, the lives of people dependent on Tax Credits will not get better in the long run and that is a shame. Now, I know I could be quite facetious to a fault, Indeed, in certain situations I am quite particular and unyielding, I expect and will not settle for anything less. 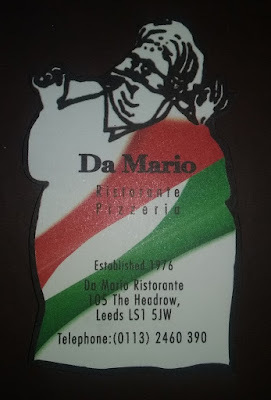 I was in Leeds for the night and I decided to go out for a meal, of all the possible cuisines I could choose from I suddenly had a craving palate for Italian fare and so I went on adventure seeking one such place. The first restaurant I called at, the maitre d’ could not make up his mind about whether he had a table or not and I was not ready to stand there looking forlorn, so I made my excuses and left. A long walk through the shopping precinct that was closing for the day, I came up to a major street known as the Headway, out of the corner of my eye I saw an Italian restaurant that had a sign that it was family-run, I should have followed my instinct then and crossed the road, but I thought I would explorer further. Into a shopping mall I went and up the escalator to what I now know is a restaurant chain - Prezzo, I stepped in got a table for one, ordered drinks, an entree and the plat principal. The drinks and the king prawns in a spicy tomato sauce with a garnishing of rocket leaves went down well and then my spaghetti carbonara arrived. At first glimpse, it did not look right, the spaghetti looked bloated and swollen and as I stuck my fork in it, there was no telling that it had been overcooked. I always have my spaghetti al dente, this looked like it could be used to hang wallpaper, it was slightly more consistent than starch. I remembered that I did not allow such a culinary faux pas to go unchallenged in a South African hotel restaurant, I certainly was not going to let this pass for food in a restaurant with pretentions to Italian fare. So I asked that they make amends and so the plate was taken away and some five minutes later a fresh plate of spaghetti carbonara arrived, but it was only marginally better, I was done with this nonsense. A concerned waitress came by to ask if I will try something else, but I was of the opinion that if they could not cut the muster with the fundamentals of Italian cooking making allowances for more complex fare will just be more foolish of me. I called for the bill and when the card machine suggested I offer a gratuity, I had to apologise to the waitress that whilst the service was good enough, my experience had been a complete let-down and it was that they failed woefully at the rudiments of pasta cooking. She then suggested that the English do not like their pasta al dente, though earlier I was told that the pasta is first cooked in the morning and then recooked for meals, either which way the mass production ethos of delivering pasta before a demand is made for it and made a mockery of Prezzo's Italian cuisine credentials. I paid up for a rotten meal and walked up the road back to this family-run outfit called Da Mario where I told the maitre d’ that I had just come from an Italian restaurant that did not know how to make spaghetti. He took it as a dare and found me a table promising they will do a better job. I guess it was cheeky of me to ask if the restaurant was indeed a real Italian restaurant. They found out they had run out of the pate I ordered for my starter and rather than opt for another choice, I asked that the main course be served. The maitre d’ then came to me and asked if they should start making my pasta and I gave the go-ahead. When it arrived, it was al dente alright, probably almost too crunchy, but it was a lot better than that soaked pasty stuff I was offered at Prezzo. Served in a deep dish, I rolled the spaghetti along the side of the dish, because Italians never use a spoon to hold the pasta to the fork - sacrilege! I savoured and finished my meal, happy that I had had something really nice, paid up and left. I am just not going to stand for soggy overcooked pasta and definitely not in a restaurant that suggests it knows something about Italian food. On this occasion, Prezzo failed to impress twice and it is unlikely my idle legs will beat a path to that establishment ever again. I have written about this many times before, my battles with Project Managers who do anything but manage the project. During my postgraduate course, I took the Project Management module and we were tested not by the methodology, but by the problems with personnel in the sub-group that we were in. Each person had a deliverable within the project assignment and some received wisdom suggested that we put a time frame on when that task had to be completed after which the task was taken away from the allottee if not completed and given to someone else to complete. In our team of five, one just did not pull his weight and when we took over his task and completed it, he threatened to report us for ostracism and discrimination. I withstood him at all points of this attempt to blackmail us pointing out his responsibility and apparent lack of consideration for others even if he just wanted to get by rather than excel as the rest of us did. Meanwhile, our lecturer was watching our exchanges and in the end commended me for handling such a difficult situation calmly, respectfully and decisively. We did not make a distinction for that module, but the biggest lesson I took away from that experience was that I did not want to be a project manager. 27 years in the Information Technology profession has taught me a few home truths and it is best illustrated in what I now call The Project Dilemma Triangle. The angles of the triangle labelled are labelled Good, Fast and Cheap, and from that I have developed a number of truisms. A very commonsensical view of projects without the attendant jargon or obfuscation with meaningless terminology. Much as I strive to do the very best job I can, I am constrained by time, by cost, sometimes by knowledge I still have acquire and mostly by project managers with unrealistic expectations. The project managers I have worked best with are those who have taken the time to come to understand what I am doing, what I am thinking and what it takes to create a deliverable that works at implementation the very first time. However, because the time and the cost is usually determined long before understanding what the work entails, the technical resource is in a bind. We are compelled to work within the constraints of the Fast and Cheap to achieve the Project Manager’s goal of the Fast and Good with everyone pretending that the Fast and Cheap will be Good and Fast. It is never the case. 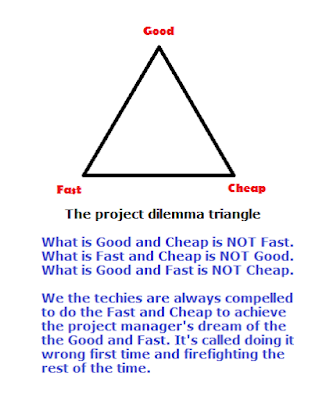 Where Fast is delivering on time and Cheap is doing it on a shoestring with Good being the minimum we can get away with that appears to work, we find that we do never really get it right the first time even if the Project Manager ticks it off as delivered and the technical resource is still left with that ‘delivered’ project, firefighting issues and problems that should never have been there is the time and scope was there to get it right from the get-go. That sums up my daily work life and the battles I am constantly fighting with Project Managers in The Project Dilemma Triangle. It began ominously with the threat that a few new recruits having not been following instructions to the letter would face the axe after the last warning. I interjected with an unusual intervention that offered to implement a technical check rather than them using the unforgiving rod of strict management. I say unusual because I have on many occasions before resisted moves by management to attempt to manage their staff through technological means when what it needed was a chat between the said parties. However, in this case, I thought it would be easier to offer a technological solution with a few logging elements that prevented the heretofore mistakes being made again. I went about crafting a solution and when I was satisfied with the first draft, I tested the functionality and then decided to put it through its paces in a simulated live environment. It was at that point that I noticed one of the critical elements of my infrastructure had gone missing like disappeared without a trace. I was livid and perplexed, as I was being informed that our office move will not take account of contractors who would be expected to hot-desk. Now, my job is not suited to hot-desking, I have many systems, some for primary usage and others for testing, along with large screens to facilitate my productivity, the whole idea was myopic in the extreme with blanket restrictions on contractual staff that the organisation needs for critical activities but are wont to treat without care or consideration. The first problem, however, was more serious, it meant everything I used to do to create a deliverable product was now not impossible to contemplate. When I lost one of my systems to a redeployment without being notified, I did not make a fuss but the new untrammelled Wild West activity that had crept into this setting was now unacceptably intolerable. I fired off an email to the supposed new manager in charge of our Wild West, our Wyatt Earp of sorts and I could only heave a sigh of relief to be informed that it had only been switched off because it was not utilised. I held my cool because, as an authentication system, it did not have to be actively accessed, but it always had to be online, anyone should know that. Soon afterwards, I heard that a desk had been reserved for me in the second tranche of moves, all this good news in the space of an hour. A day that seemed to be going downhill fast was suddenly snatched out of the jaws of despair. I finished my tests, crafted an implementation notice and sent it off to all that mattered and within minutes, thanks and gratitude came flowing in. What a day that was. Pedantry and facetiousness, the bothersome discomfiture of seeking the proper and correct out of the disordered and the ignorant. Maybe, it just the lack of attention to detail, the kind of detail that means if and consideration were paid to the minutiae no one will be pulling their hairs out in frustration trying to fix problems that should never have been there in the first place. Hey! I literally live in a working world of the Wild West. Yet, for my sanity and sanity indeed, I find that some things are not worth venting over, we resort to doing what we know best to do and hope that our troubles are assuaged to some extent by the gratitude of some who can deign to appreciate that our intentions and deeds are for more than the good and tending towards the best that could be done in the circumstances. Another thing one has decided to tolerate and probably ignore is that has been a bugbear for too long, the ignorance of the sartorial, all buttons done up on a suit jacket. One must accept that not everyone will know and there was a time I did not know too, but I have known for too long now that I can hardly remember when I didn’t know what to do. Then again, like a watchword or a password, tolerance has given this to the Shibboleth, those who are aware are appreciated for knowing and those who are not are left on the scrapheap of the separated and ignorance. There is no lifelong aim to bring culture to the Philistine just like not every glistening stone can be cut into a precious gem. You choose your stones with care before you fashion the stone for greater value. I can live with the fact that we cannot all be meticulously pedantic to a fault and annoying irritation. If I do not have to exercise the emotional negativity of prejudging those outside the tent of proper and right, I can accommodate difference enough to know that we would never all be the same, that kind of diversity makes for what our humanity is all about. It is with great difficulty that I can carry this mental disposition into my professional life and long may it be that this will be the hallmark for which one is known and remembered for.